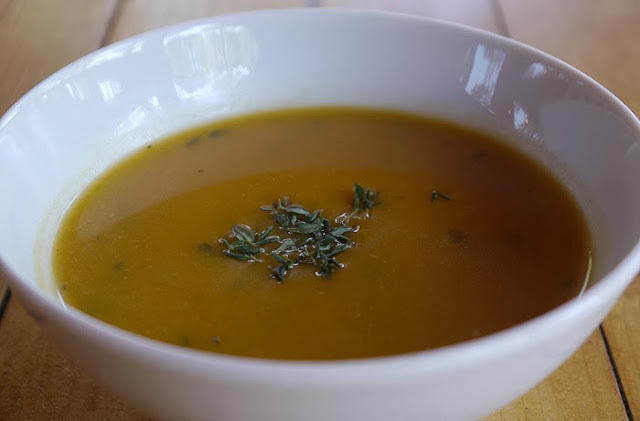 In my brown bag this week: Butternut Squash Soup. Winter squash comes in many varieties, some of the more common being, butternut, acorn and delicata. Each one is different in taste and texture from the other and should be used accordingly in recipes. Butternut squash lends itself well to soups because it tends to be a lot less stringy than the other types. Once cooked it's really easy to puree. It can be stored for up to about 3 months in a cool dry place and will stay fresh cut up in the fridge for a week. Seeds from the squash, just like pumpkin, make a wonderful snack food. Scoop them out, place in a single layer on a cookie sheet and lightly roast at about 150 degrees for 20 minutes. Butternut squash has a unique shape that requires a special approach to cutting. To cut into cubes, it is best to first cut it in half lengthwise. Scoop out seeds and slice into cubes. Low in fat and high in fiber butternut squash is a great heart healthy choice. Packaged in small containers and paired with some whole grain bread it makes a nice light lunch option. 1. In a large saucepan,heat oil over medium high heat. Add onions and cook, stirring, for 5 to 6 minutes or until softened. 2. Stir in squash, sage, thyme, pepper and broth. Bring to a boil. Reduce heat and simmer, stirring occasionally, for 30 to 35 minutes or until squash is very tender. 3. Working in batches, transfer soup to food processor (or use immersion blender in pot) and puree until smooth. Return soup to pan (if necessary). Warm over medium heat, stirring, for 1 minute. Whisk in buttermilk and honey, heat for 30 seconds. Serve. Awesome recipe (I love the combination of sage with squash - I'd even use a little crisp-fried sage as the garnish) BUT, wow, seriously? Pureed squash keeps "3 months in a cool dry place"? Maybe if pressure canned?